• Walk-in humidors, self-serve cigar displays and mail order cigar sales would be banned. • All flavored cigars such as rum, cognac, bourbon, vanilla and coffee would be banned. • Ornate, decorative cigar boxes would be covered with grotesque, graphic images of dead people. • New user fees (taxes) would be imposed on your cigars to fund the beurocrats at the FDA to regulate your cigars. • Nicotine levels in cigars could be regulated to near zero levels...bye bye strong cigars. Now if all of this has got your freedom loving, proud to be an American blood boiling, there is something you can do about it. Right now there is a bill in Congress (H.R. 1639) called "Traditional Cigar Manufacturing & Small Business Preservation Act". This bill would clarify the Tobacco Control Act so that the premium cigars that you and I love would be "hands off" by the FDA. To get this bill passed, we need your help. Call, write, email or meet your congressman and senators and ask them to support H.R. 1639. 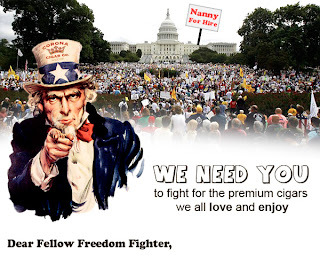 We have a handy link on CoronaCigar.com where you can easily email your elected officials. Click Here and Urge your Members of Congress to Co-Sponsor HR1639!